GIMP 2.8.14 was released yesterday, bringing various bug fixes and small enhancements. This is the stable GIMP branch and no new features are added in the 2.8.x releases, just bug fixes. 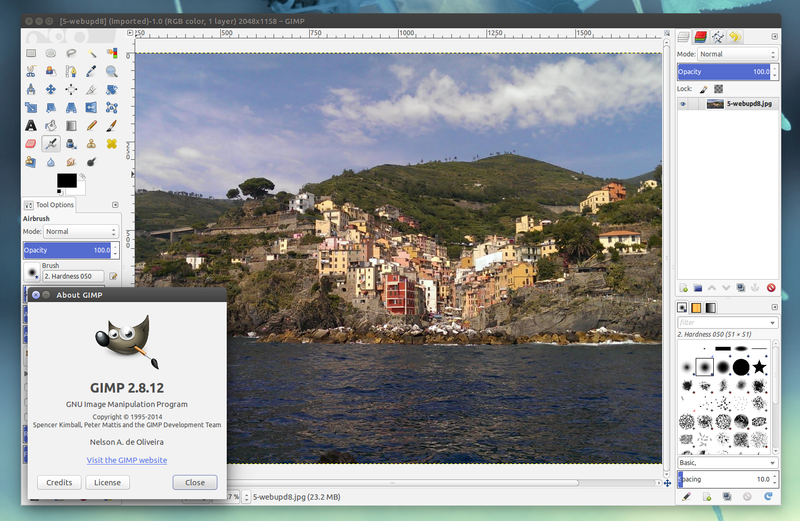 Update: the Ubuntu / Linux Mint PPA now has GIMP 2.8.14: "Yesterday's 2.8.12 release had broken library versioning, so we had to roll out GIMP 2.8.14 today. The only change is the fixed libtool versioning". The next major GIMP release - 2.10 (release date not known yet) -, should bring a complete port to GEGL / high bit depths, support layer masks on layer groups, new warp tool, seamless cloning, unified transform tool and more. Most of these features are work in progress and already available in the latest GIMP development builds - if you want to give it a try under Ubuntu, you can use a PPA to install the latest GIMP 2.10 development builds. This PPA also provides the latest G'MIC for GIMP (which includes a collection of about 400 image filters and effects) and I recommend you check it out. For other Linux distributions, Windows and Mac OS X, see the GIMP downloads page.